Unfinished capriccio showing two small plans and an elevation for what is probably a mausoleum, arranged as a two-storey basement of a rectangular tower supporting an obelisk. This is composed of aedicular windows on a basement with columns in pairs above, supporting sculptural figures and the fluted base of thr obelisk column. 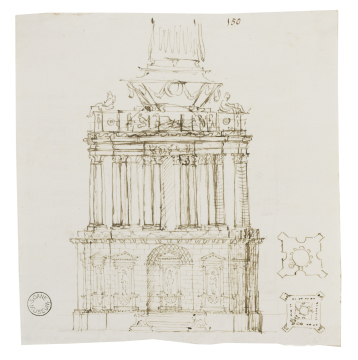 You are here: CollectionsOnline / Unfinished capriccio showing two small plans and an elevation for what is probably a mausoleum, arranged as a two-storey basement of a rectangular tower supporting an obelisk. This is composed of aedicular windows on a basement with columns in pairs above, supporting sculptural figures and the fluted base of thr obelisk column. Outline of a wall of three bays. This drawing can presumably be dated to 1755. Charles Hope was with Robert Adam when he arrived in Rome in February 1755, but did not return from Naples with Adam in May. According to Adam '... but as I found he wanted to gull me out of a little more of my money by taking me to see palaces with him in order to pay half of his expense, I avoided him as I would Hell Fire ...' (see J. Fleming, Robert Adam and His Circle in Edinburgh & Rome, London, 1962, p.179). There is also a strong Hope connection in Adam vol.55/40. There is a larger unfinished chalk drawing for this scheme in Adam vol.55/26, but with a plain attic roof rather than an obelisk. The broken column or obelisk reappears in the pavilion in Adam vol.55/152. This composition may be contrasted with its Gothic counterpart in Adam vol.55/24.